Amazing Oceanview! 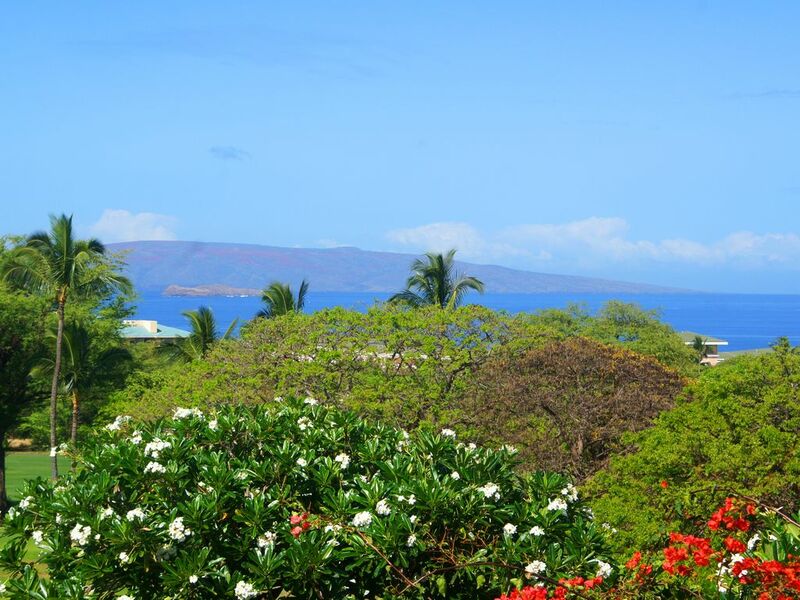 Wailea Ekolu 1BR/2BA - Walk to Golf! Lesli's luxury Wailea Ekolu Village Condominium is a 900-square-foot, one bedroom, two bath, oceanview condo, occupying the ground floor of a two-story building. Ekolu 107 accommodates up to four adults comfortably. It is fully-appointed and includes phone, radio/iPod dock, cable TV, WiFi, and personal touches for your enjoyment and convenience. There is a full kitchen with stove, microwave, refrigerator, dishwasher, dishes, and utensils. Small appliances such as coffeemaker, toaster, blender, hair dryer, and iron/ironing board are also provided. Towels, linens, and beach towels are included. Lesli's guests also have access to beach chairs, picnic coolers, a few board games, and lots of novels. The unit has two private lanais (patios) with oceanviews, two full baths, and a washer/dryer. The master bedroom has a California King-size bed and the living room incorporates a daybed with a trundle (both are twin-size). The condominium is cooled by your choice of ceiling fans, tropical breezes, or air conditioning. This condominium is privately owned and cared for. Lesli is able to offer very attractive rates since she does not use a rental agency. In addition, she has her friend, Natalie, here on the island to help you with your immediate needs, check in/out cleaning, and any maintenance during your stay. The condominium is clean when you arrive and it is cleaned again when you leave. The Ekolu Village has barbecue areas in a garden setting overlooking the golf course and ocean, and two swimming pools. The building is two-stories (low rise). Guests staying in Lesli's Wailea condominium are given a voucher to qualifies them for any special seasonal discounts offered by Wailea Golf and Tennis for resort guests. The condo is a 15-minute walk (about 1500 feet) from the beach; but most people drive their car as there is free public parking at the beaches. Wailea has five beautiful beaches along a mile and a half of coastline! Lesli, along with her husband, son, and daughter, travel from California to stay in her condominium a couple times a year and consider it their second home. Please click on the link below for MORE INFO, photos, and maps of Ekolu 107! Aloha! My name is Lesli Brodbeck; to my hula sisters I am Maluhia (actually Maluhia'oke'ahi'ahi, or 'Peaceful Evening'). Together with my husband Kelly I own Ekolu 107. Although I currently live in Santa Barbara, I continue to dance Hula with my local halau and paddle with the Santa Barbara Outrigger Canoe Club. In his free time my husband designs gardens, explores photograpy, and enjoys scuba diving. When I'm not dancing, paddling, or busy with an art project I love to visit our two adult children in the Bay Area. Our family is completed by 2 kitties ( Polo & Hiwakea Kiko) and a pond full of koi. My family moved to Maui in the 1970's, when there was only one stoplight on the island. I grew up visiting them, talking story and learning about their condo rentals. I earned pocket money during summer vacations by 'cleaning condo'. During the time that my family lived in Wailea I fell in love with Ekolu Village. I remember my Auntie telling time by the boats heading to Molokini and the United Airlines flights overhead ('It must be 11:15, that's the flight from San Francisco'). I dreamed that someday I would own my own Ekolu condo and follow in their footsteps. And now Ekolu 107 is my home away from home! When my family and I stay at Ekolu 107 we live local. I shop the farmer's markets and my husband shops the local nursery. We even went to Kihei Ace Hardware on our 20th anniversary! We spend as much time as possible with my family Upcountry. The kids love exploring the rainforest and diving into local lava pools. My husband and I enjoy a nice glass of wine and talking story with the adults. For special outings we go zip lining on Haleakala and snorkeling at La Perouse Bay. I'm just as happy to shop the container stores (local entrepreneurs travel to Indonesia, load a shipping container with items, & open their warehouse doors when the container arrives on Maui) with my cousin Liz or spend a leisurely morning at Maui Friends of the Library in Puunene (suggested donation: 10 cents per book). In the evenings you may find me at line dancing or a ballroom dance class with Liz, or we may go as a family to see Cousin Jimmy drumming with one of his bands (Uncle Dirty, Haiku Hillbillies, Benoit Jazz Works). There is so much to do on Maui and I never seem to have time for it all! Wailea Ekolu Building 1 overlooks the Wailea Golf Club and clubhouse. From Ekolu 107 you gaze over the 15th fairway of Wailea's beautiful Blue course out to the Pacific with views of the islands of Molokini, Kahoolawe, and Lanai. Even the kitchen has an ocean view! Ekolu Village offers an extensive bookshelf for its guests. When you finish a book visit the Village Clubhouse...choose a new book and feel free to leave your finished book for others to enjoy! A lush, private garden with ocean view is a rare treat in condo living. Enjoy your morning coffee surrounded by Ekolu 107's serene tropical garden. The Wailea Tennis Club is located less than one mile from Ekolu 107. Your rental includes a voucher that entitles you to the Club's Wailea Resort seasonal guest rates. The Wailea Golf Clubhouse is located just a short walk from Ekolu 107. Ekolu Village has 2 pools. One is in the lower village; one is in the upper village. My family of 4 stayed here for a little over a week at the beginning of March and absolutely loved our stay at Ekolu 107. The lanais had absolutely stunning views and it was mostly a quiet and peaceful for a relaxing part of our stay. We took full advantage of the kitchen to make our meals as we explored the island. Lesli, thank you for sharing your beautiful home. The personalized touches in 107 and the stories in your notebook were a delight to see. Kelly's favorite thing to do when we're at home on Maui is to garden and he puts all of his aloha into making our private Ekolu garden a special place. I'm so glad you enjoyed it...he'll be so happy when I share this with him. Please let me assure you that Ekolu 107 is a fully non-smoking unit and that smoking is not allowed in any common area throughout Ekolu village (including condo lanai areas). The policy is well signed on each lanai and throughout the village common areas. Although guests may be allowed to smoke inside Ekolu Village units depending upon their contract with their unit owner, other guests should feel free to contact the Ekolu Village manager if they are impacted by another guest's outdoor smoking. The Ekolu Village manager will assist in educating the non-compliant guest about Village policy. Thank you so much for sharing your home. The views are amazing and location is prefect. We had a lovely stay thank you! Gorgeous condo with fantastic gardens and ocean views! You can tell the love that Lesli has for her Hawaiian home! It is furnished with beautiful old style Hawaiian pieces, lovely quilts and crockery plates adorn the walls. The four poster bed is an artwork as well! This is a place where you’re not sorry to be inside at all! However the view from the lanai will pull you out regularly! The gardens around you are incredible with gardenias , bird of paradise and other lovely blooms. My hope is always that my guests will enjoy living at Ekolu 107 as if they are locals. I want Ekolu 107 to be more than just another rental to my guests...I want it to feel like a comfortable and unique Hawaiian retreat! We loved your place. the view was amazing, kitchen and bedroom pretty and well appointed. Mahalo for your review! I definitely appreciate you sharing your thoughts. We do have a radio/iPod dock but I notice that it often gets stored on the shelf in the TV cabinet so I can see how you may have missed it. Also, let me know what else you would like to see in the kitchen. I'm always open to suggestions. Condo had a fantastic ocean view. Was fairly clean and had most amenities on offer. Owner was very responsive and accommodating. There were some maintenance issues but nothing to keep us from enjoying our vacation. Ekolu 107 is within walking distance (or a short drive) to Wailea's 5 famous beaches. Enjoy boogie boarding, swimming with sea turtles, snorkeling, or lounging on the sand with a good book. Surfing lessons are available in nearby Kihei.